drama* on the waterfront: Behind-the-scenes with Kings of the Gym Stage Manager Oscar Mulheron. Behind-the-scenes with Kings of the Gym Stage Manager Oscar Mulheron. 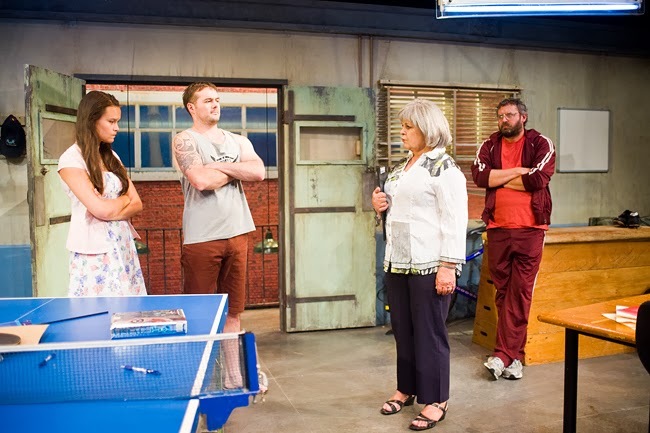 Kings of the Gym Stage Manager Oscar Mulheron talks to drama on the waterfront about his accidental career, working with his uncle and the highs and lows of stage management. The cast of Kings of the Gym. Photo by Stephen A'Court. DOTW: How did you get into Stage Management and what was the appeal? OM: I really fell into it by chance. One night my Uncle, director Danny Mulheron, came round to our house and when I asked him what he was working on he started talking about his exciting next project ­- a new play by Simon Cunliffe called The Truth Game. It was going to open at Circa Theatre in a few months. He talked about it with such passion and enthusiasm and I felt how really exciting it sounded. Well - one thing led to another and at the end of the evening he offered me a job as Stage Manager. As I was between jobs and at a bit of a loose end, it seemed very opportune, so I took the plunge and accepted. I had never stage managed before and I had no idea of what it involved but I felt that I really wanted to be part of this production. DOTW: You are working at the moment on Kings of the Gym and once again your uncle is the director. How does that work out? OM: It works really well - nearly all the time! Working in the theatre can be extremely demanding and stressful. It has been a good thing to know Danny first as family member. It meant that we had an ease together and an understanding from the beginning. Danny is very passionate and totally focussed and we both had a total commitment to the production. I learnt on the job very quickly what had to be done and of course I wanted to get it right because Danny put his trust in me. This is the 4th production I have Stage Managed for him and I pretty well know the process now and can make sure things happen as well as he wants. DOTW: What is your most favourite production you have worked on and why? OM: It’s always the production I’m working on at the moment, which is Kings of the Gym - but for some reason I keep thinking of The Truth Game. I suppose because it was the first production I worked on. I was certainly thrown in the deep end and it was a very fast learning curb. During the rehearsal period I enjoyed watching for the first time the actors developing their roles and bringing it all together – seeing the process of devising and interpreting the script. Danny gets completely involved and is very open to suggestions and input which is one of his strengths. I loved that sometimes at the end of a rehearsal he would sit round with them and re-work a particular scene to find the substance and the story line. During the run of the play it involved the management of a great number of props – all of which had to be placed in a very exact position. It made each performance very demanding. I definitely had to be on form every night. DOTW: There must be lots of funny moments bringing a production together. What is the funniest moment you have experienced? which was needed on the set and had been bought on TradeMe. I arrived at the house I was to get it from and discovered it was perched on the side of a hill and had to be reached by a cable car. It was fine going up but getting the table on to the cable car to come down was quite something else. With a lot of juggling it was finally achieved. It was blowing a gale and at one stage I thought it would take off and blow down the hill. Having achieved that part I arrived at the car only to discover that I didn’t have a hope of getting it to fit in. No matter how I manipulated and pushed and pulled and tried every possible configuration I realised that it just wasn’t going to go in. I had a sudden inspiration to take off the table legs. Of course I had no tools to unscrew them. I then spotted a building site across the road. They were very willing to lend me a screw-driver and this did the trick. I was really pleased with myself with what seemed like a major achievement, and arrived back at Circa with the table ... only to be told that in the meantime they had a found another one that would work better so didn’t need it after all! OM: It was a sponsor’s night for The Truth Game and they had asked if they could have the earlier start time of 6.30 instead of 8pm. We had had discussed it and it was agreed by all that we would be happy to do that. However, somehow on the night – which was a few weeks later – at the half hour call only 3 of the five actors had arrived. It caused quite a bit of panic on my part as I tried desperately to contact them. One lived nearby so arrived pretty quickly but the other lived some way away and when I finally managed to get hold of her she not only had to get herself there but also had to find someone to mind her 2 year old daughter – in less than 25 minutes! To this day I don’t know how she arrived, got ready in costume, make up and on stage and on time. She opened the play with a rather long soliloquy and I was so relieved that she had made it. DOTW: What would you say are the most important skills to have as a stage manager? OM: Anticipation, consideration and of course organisation. And probably being able to multi-task and definitely being adaptable. DOTW: What is it that you enjoy about being a Stage Manager? OM: There are a lot of things but something I have really liked on both The Truth Game and Kings was working with our designer Dennis Hearfield and producer Howard Taylor. We had a lot of props to source. And then it was the satisfaction of seeing them all being used as part of the production in a very important way! We had great fun looking for and finding them all. DOTW: Where to from here? OM: I feel I need a break so I might take time out to do a trip to Thailand or somewhere in Asia. A friend of mine has just come back and it has tempted me to take a look. A while ago I went to the USA and enjoyed seeing a new and different country. I think now it would be a good time for me to take a look at Asia. Kings of the Gym is on until 15 February. To book, call the Circa Box Office on 801-7992 or visit www.circa.co.nz. There will be a New Zealand Sign Language interpreted performance on Friday, 14 February. To book for that, please email circa@circa.co.nz.